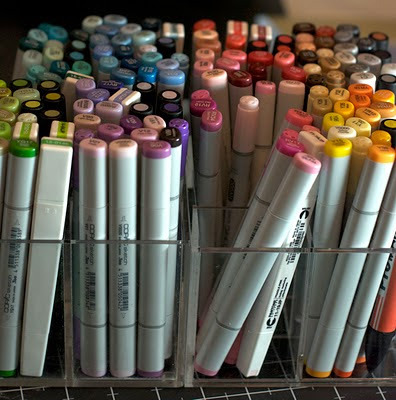 Although some of you may have seen this before over at my Crafty Storage blog, I wanted to share it here again as I often get asked how I store my markers. 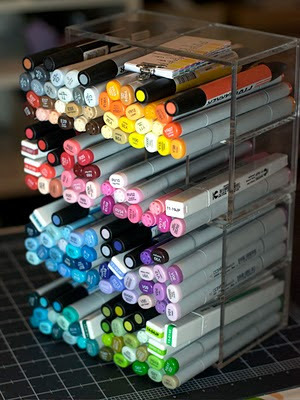 This is how I store my solvent based markers, using an Acrylic Partition Desk Tidy from Muji. Several advantages. One of them is that you can store two ways: horizontal, perfect for one person, or upright for sharing. The other main advantage is that you can store a couple -maybe more- on top of each other like above.